Bitters are a common bar ingredient that were considered a necessity in the early definition of a cocktail but were left out of many drinks until their recent comeback thanks, in part, to an interest in classic cocktails. Many brands of bitters began as medicinal tonics and soon found a home in cocktails as concentrated flavor stimulants that add a nice kick to the mix even though they are only used by the dash. The often secret formulas include a variety of herbs, fruits, spices, and roots distilled in a base liquor. 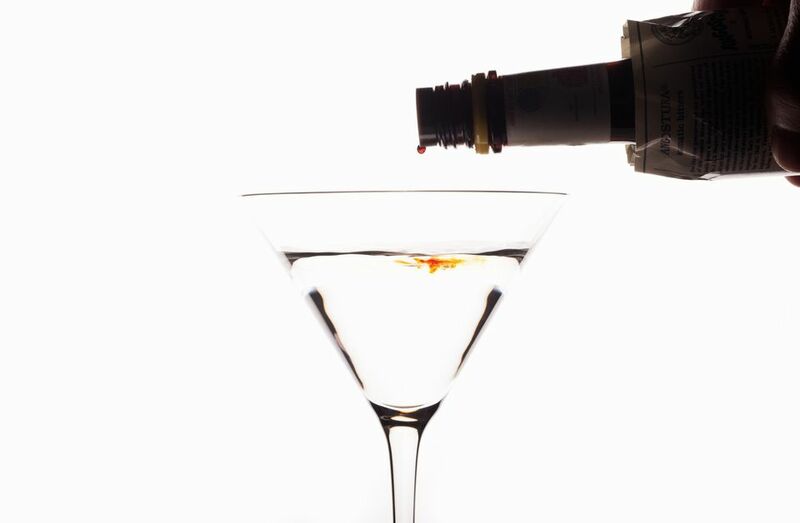 In today's bar, bitters are essential, continue to evolve, and each brings its own qualities to each cocktail, so don't be afraid to experiment. A number of bitter producers are listed below. These are some of the best known, though there are a growing number of small brands that are producing some great bitters. Brooklyn Hemispherical Bitters' Black Mission Fig is just one example of these and one that I recommend checking out. Bitters are nonpotable, meaning that they are not meant to be consumed neat or on the rocks. Bitters can also be used in cooking: soups, salad dressings, pumpkin and apple pies, fish, etc. Orange bitters were once favored over aromatic and were in the original Martini. Make your own bitters. Find other great recipes in the books Imbibe!, Joy of Mixology and The Everything Bartender's Book. Older bitters which are almost extinct but may be listed in traditional recipes include Boker's, Boonekamp, Amer Picon, Hostetter's, West Indies, Pepsin, Fernet Branca, and Underberg. Substitute the modern brands if you see them in print. Better known as liqueurs, Averna and Campari are bitters as well. An excellent source for unusual bitters is Cocktail Kingdom. Bitters: A Spirited History of a Classic Cure-All - Written by Brad Thomas Parsons, this is an excellent book that explains bitters in great detail and includes recipes. 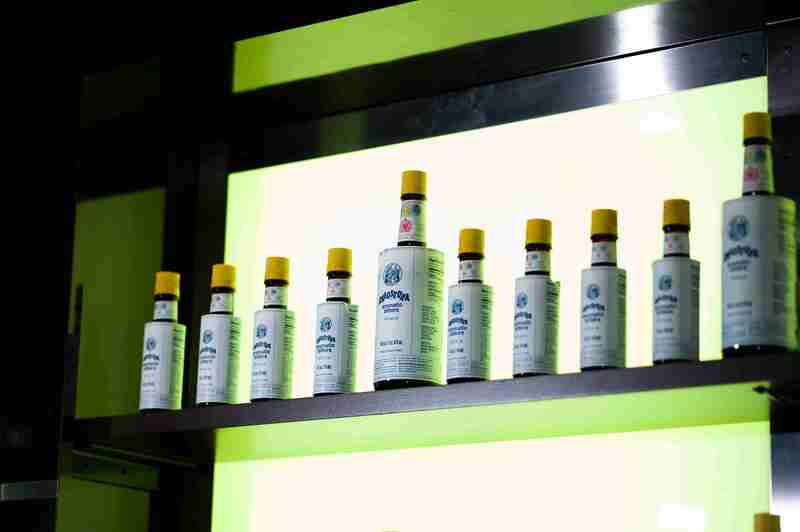 Possibly the most popular brand of bitters, Angostura should be considered a must when stocking a bar of any seriousness. The story begins with Johann Gottlieb Benjamin Siegert, a German doctor who found himself in Angostura, Venezuela in 1824 where he created this secret blend of tropical herbs and plants with the intent of curing a variety of illnesses. The brand is now produced in Trinidad and the blend is still a well-kept, but much appreciated secret. The oversized, awkward label has also become a trademark of the brand. It's said that the wrong size was ordered and everyone in the facility thought someone else would fix the mistake, no one did and the label remains. In 2008 Angostura released an orange bitter and it's everything one would anticipate from a company held in such high esteem in this tiny bottle market. This bottling has the same signature label as its aromatic counterpart so it is easily recognizable on the shelf. The clear bitters hold a perfectly citrus taste and compliment the best of cocktails when just a touch of acidic, bitter citrus is needed. Fee Brothers has a line of bitters that has been produced in Rochester New York since the 1950's. What started for the family in 1847 as a butcher, then liquor, shop developed into a winery and importer. The bitters came later and rose in popularity with the distinction of being one of the most diverse lines of bitters. Other Fee Brothers Bitters include: Black Walnut, Celery, Cherry, Cranberry, Gin Barrel-Aged Orange, Plum, and West Indian Orange. Antoine Peychaud was an apothecary in 1830's New Orleans and began his mixing career after hours in his pharmacy. It was at that time that Peychaud mixed up his secret-recipe bitters with brandy and absinthe and created the first Sazerac, a cocktail that defined and influenced future cocktails. Peychaud's bitters are used today in a number of cocktails, and the aromatic blend is considered one of the must-have's of any well-stocked bar. One of the newest bitters on the scene, Regans' Orange Bitter No. 6 is a shining star in the cocktail world. The idea was that of cocktail experts and authors Gary and Mardee Regan, who in the 1990's wanted a better orange bitter. The result is versatile bitters of orange peel, cardamom, caraway, coriander and other herbs inspired by an old recipe. Scrappy's was one of the first handcrafted bitters labels in the U.S. during the recent cocktail (and bitter) resurgence. The company started in 2008, and their simply flavored bitters are extremely useful in a variety of cocktails. The current product line includes: Aromatic, Cardamom, Celery, Chocolate, Grapefruit, Lavender, Lime, and Orange. The Bitter Truth and Bittermens were once working together to produce a few bottle of bitters, though it now seems that they are separated and each producing full lines of bitters. Read a review of the bitters from that time with the understanding that either of these companies is now solely responsible for different flavors. That said, The Bitter Truth makes some of the best bitters you will find on the market today. Each of these were formulated specifically for classic cocktails and are perfect for modern drinks as well. Another craft bitters brand, Bittercube produces a variety of unique bitters that can turn many favorite cocktails into spectacular drinks. Their Bolivar bitters are aromatic and can be used in any cocktail calling for bitters while the Jamaican #1 and #2 bitters are designed perfectly for tropical cocktails. The Bitter End produces some interesting bitters that are fun to experiment with. They are handcrafted and use natural ingredients. The current list of bitters includes: Chesapeake Bay, Curry, Jamaican Jerk, Memphis Barbeque, Mexican Mole, Moroccan, and Thai. Bittermens produces a line of bitters that are fun to play with and are different from those produced by other companies. The product line is very experimental and interesting and includes the following flavors: Xocolatl Mole, Hopped Grapefruit, Elemakule Tiki, Burlesque Bitters, New England Spiced Cranberry, New Orleans Coffee, and Aromatic Cucumber. The Greenbar Collective has an interesting collection of bitters that rotates from time to time. The distillery works with individual bartenders to create innovative bitters that are exciting to work with. The current list of bitters includes: Baked Apple, Chinese Bitters, Fennel, and Lavender Spice.